Sonoma events in April 2019 include the Battle of the Brews, Earth Day festivals, and Passport to Dry Creek Valley. You will also find plenty of wine tasting events at local wineries and a few other fun things to do this month. Read on for details on the best activities in Sonoma this April. The Garagiste Festival in Northern California is right here in Sonoma County! This is one of the Sonoma events in April that celebrates the wines from lesser known wineries producing a small number, but highly tasty wines. Pick of the Vine is one of the fun one-day Sonoma events in April where you can sample the best of Sonoma's wine and beer. The event will be held in Santa Rosa at the Luther Burbank Center for the Arts. More than 30 wineries and craft breweries will be serving up their creations from 6pm to 9pm. Proceeds from this event go to benefit the Senior Advocacy Service. Every weekend, you will find a variety of fun wine tasting events at wineries all around Sonoma County. They include wine tasting, food pairing and even hikes around the vineyards. These are smaller Sonoma events in April, yet very popular and are open to the public. You will also usually receive discounted ticket prices to the event if you are a member of the winery. Head over to the Occidental Center for the Arts for the annual Occidental Fool's Day Parade. The laughs, and silliness, go on through the day as Zero the Clown presides over the parade and the king and queen are crowned along with Lunapillar rides! This is one of the Sonoma events in April that also has a BBQ and other fun events throughout the festival. The proceeds go to benefit their art center, so it's a fun way to show your support. This event is located at the Occidental Community Center. Activities run from 1pm to 3pm. Healdsburg is known for fantastic hotels, amazing meals, and world class wines, but it is also known for one of the best bicycle rides in the world. There are many options for you to choose from; the rides start at 20 miles, progress to 35 and max out at 60 miles. The 20 is primarily flat so most riders could easily do it, while the 35 and 60 are a bit more hilly and challenging. One of the reasons that this is one of the most popular Sonoma events in May is that you get to cruise through the beautiful wine area, but moreover you get a glass of wine when you finish the ride. Your registration also includes fruit and baked good for breakfast, snacks and water at rest stops, a catered lunch, and best of all, a special Healdsburg Bicycle Tour bandana with a map of all three courses! All three distances have the same price so you can choose which distance you want to ride on the day of the event! Healdsburg is usually quite busy during the spring so make sure to plan and book this cycling tour and your lodging in advance. Click the links below for tickets to these Sonoma events in April 2019. Battle of the Brews is a one day event featuring 50 different food and beer vendors. All of them are trying to get your vote to win the People's Choice award. Sample and vote for your favorites. It's sponsored by the 20-30 Club of Santa Rosa and proceeds to help the needy and disadvantaged kids in Sonoma County. The event is located at the Sonoma County Fairgrounds in Santa Rosa. Tickets are available at varying locations, online and in person, and the event starts at 1 pm, so don't be late! Learn more and taste wines from the Olivet District in the Russian River Valley. This district includes wineries in Windsor and Santa Rosa. The event features wineries including Battaglini, De Loach, Harvest Moon, Hook & Ladder, and others. The wine tasting runs on Saturday from 11am to 4pm. This is one of the Sonoma events in April where each ticket holder receives a logoed wine glass and special offers from participating wineries. Are you planning to stay for a night or two to enjoy some of these Sonoma events in April? If so, make sure to check out the great deals on hotels all around Sonoma County. The free Earthy Day Festival starts at noon and continues until 4 pm at the Santa Rosa City Hall. The festival is centered around conservation, community and protecting the Earth. Events include food, live events that focus on local and earth friendly products. There are also talks to help explain how you can also help create a healthier environment both at home and around the world. Before the festival, make sure to help the environment with a group cleanup of Santa Rosa creek. You can help clean up the river, while saving native plants and doing some trail maintenance. The two-day Apple Blossom Festival includes music, dancing, and a lot of fun. The event kicks off on Saturday with a parade at 10am on Main Street in the lovely town of Sebastopol. The parade includes marching bands, floats, horses, and many other participants. In addition, there is also an art show and a special section for kids that include an animal farm for them to play in and explore. This area also has rides for the kids, a train station and games for them to enjoy. Tickets are available at the festival. This is one of the Sonoma events in April where there are different prices depending on age or if you purchase for one or two days. Kids under 10 are free. After you enjoy these Sonoma events in April, make sure to visit some of our local wineries to sample our amazing wines. Here are just a few of the places that you can pick up discounts on Groupon before your tasting. Visit the City of Windsor on April 14 to celebrate Earth and Wellness Day on the Windsor Town Green. This year's events include children's games and crafts. There are also plants for sale to spruce up your home. The Earth and Wellness Day provides many choices for educational seminars and presentations that will inform, and excite, everyone. There are many choices for food and drink available too. The event runs from 10 am to 1 pm. Enjoy a day of tasting rose wines at Barndiva Gardens in Healdsburg. This event features roses from Sonoma, Napa, and Mendocino wineries. In addition, this event includes food and an afternoon of fun. The event runs from 12pm to 3pm at Barndiva Gardens at 237 Center Street in Healdsburg. This is one of the newer and more popular Sonoma events in April, so get your tickets early! Passport to Dry Creek is the premier wine tasting event in the Dry Creek Valley wine region every year. It's a chance to sample some of the best local wines paired with gourmet goodies from top local chefs. More than 45 wineries in the district participate every year. For two days, you will go from winery to winery to sample wine, enjoy tasty goodies, listen to live music and participate in other fun activities. 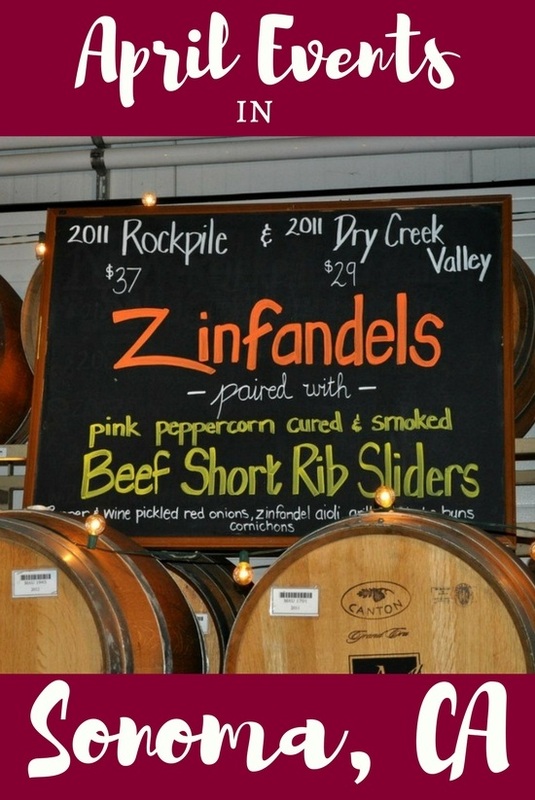 It's a great way to get to know the wines of this region as well as meet some of the winemakers and other Dry Creek Valley wine lovers along the way. This is my favorite Sonoma events in April and one you will not want to miss! It runs from 11 am to 4:30 pm both days. Just an hour north of San Francisco is the charming town of Petaluma. Back in the day, Petaluma was primarily known as a farming community, and therefore the Butter & Egg Day celebration to honor its heritage. This special celebration opens at 10 am and the parade starts at noon. This is not one of your average festivals as it incorporates a lot of the old Petaluma day heritage including events such as Cow Chip throwing contest (if you don't know what that is, it is best to look it up before competing) and the Cutest Chick contest. As with many festivals, it does include food and beverages, art and craft vendors and kids' activities. If you want to support the locals, and enjoy a delicious breakfast, the Lions Club puts on one from 8 to 11 am on Main Street across from Putnam Plaza. If you decide to spend the night, and extend your trip, there is also the Spring Antique Faire on Sunday. Both events are free to attend. The day after the Petaluma Butter and Egg Days the city holds their annual Spring Antique Faire. Stroll the gorgeous streets of Petaluma as you admire their antiques including jewelry, furniture, art, books and so many other items. It's one of the larger Sonoma events in April with around 8,000 people in attendance each year. Make sure to arrive early to find the best items. If you get want to grab a bit of breakfast before you start searching for your little bit of history, the Mason's prepare a wonderful breakfast, for $8, that starts at 8 am and continues until 11 am. This breakfast costs 8 dollars but the Spring Antique Faire is always free. In addition to these Sonoma events in April, you will find a variety of other fun things to do from sunrise hot air balloon rides to cycling tours. Here are some of the best things to do in Sonoma this month.